Nearing the end of August, I would like to share one of my favourite recipes from Yummy Workshop. Four years ago, I started my blog, as a way to share my cooking experiences and as a way to try food writing so I can write a cookbook someday. In April 2012, I participated in the fundraising event “Indulge n’ Dance”, and I contributed my “salted caramel and chocolate ganache tarts”. I was far from being a professional baker at that time, I had a great time that night, knowing many people enjoyed my dessert. I don’t recall how I developed the recipe for this dessert. The recipe has evolved many times over these years. I eventually started selling them at bakers’ and craft markets and they were always my best-selling treats. 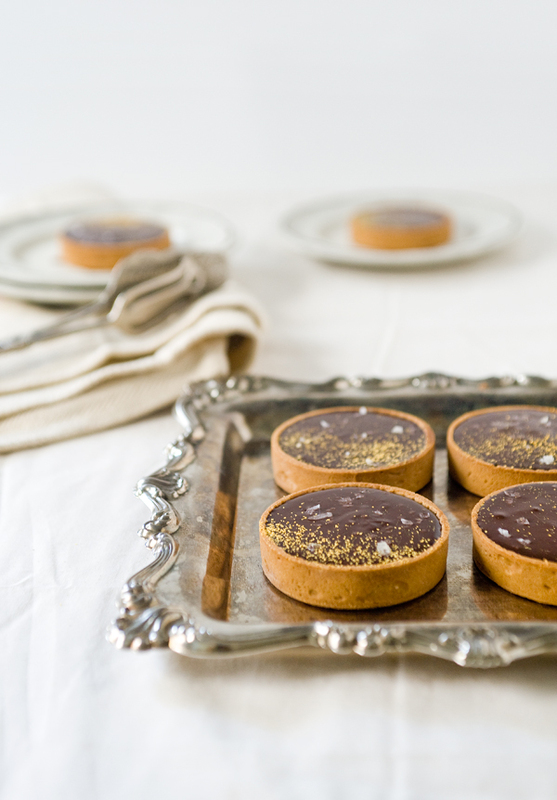 As a shout-out to Yummy Workshop’s fourth birthday, I am sharing my this Salted Dark Caramel and Chocolate Tart recipe. This is a grownup version of the original recipe, just like how much Yummy Workshop and I have grown. After making hundreds of them, I think this might be the best version I’ve made ever. In mixer bowl, place in butter, salt, and icing sugar. Beat with a paddle attachment on medium speed until it is well mixed, becoming pale in colour. Add in vanilla extract, and eggs in 3 additions, make sure it is well incorporated before adding more eggs. Scrape down the sides bowl after each addition to ensure even distribution. On low speed, add in flour, mix until just incorporated, don't over mix otherwise tart will be tough. Divide dough in half, and wrap each portion into disks and chill in refrigerator overnight. Before rolling, let dough sit out for about 10-15 minutes to soften. On a lightly floured surface, roll out dough to about 3-4mm thick, turning the dough after each roll to prevent sticking, flour as needed. Measure the size of your tart pan/ring, cut out the shapes you need. If the dough is too warm, place it back in the fridge to chill, otherwise you can start lining the pan/ring. When lining, be sure to get into the edges on the bottom, flush the dough right up to the top of the pan, trim off excess. Chill lined pan/ring. Pierce the bottoms of the tart with a fork before baking, or blind bake them (yields nicer looking shells - optional). Bake at 325 F for 15-20 minutes or until golden brown. Blind baking (see photos): Line chilled tart pan/rings with parchment, fill with beans or rice, up to the top. Bake until edges start to brown, take out and remove paper, beans and take out from the pans/rings, return to oven to bake to golden brown. Remove shells from pans/ring, let cool until ready to use. In a small saucepan, cook sugar to dark amber colour, swirling pan to caramelize evenly - try not to stir it. Slowly add in whipping cream, be careful as the caramel is very hot and it will splatter slightly. Cook to 108C and take off heat. Cool caramel for about 5 minutes, stir in butter, salt, and vanilla extract. Let cool until ready to use. * Make chocolate ganache just when you are ready to fill, otherwise it might set too soon. Place chopped chocolate in a medium bowl. Heat whipping cream in a microwave safe measuring cup for about 1-1.5 minutes, until it bubble slightly on the sides of the cup. Pour hot cream into chocolate, avoid stirring right away and cover bowl with plastic wrap for about 1 minute. In the mean time, heat butter and honey until lukewarm in a small bowl, for about 30-40 seconds. Stir ganache with a spatula from the center outwards, slowly incorporate the ingredients. Lastly, stir in warmed butter/honey, and vanilla extract. Have tart shells ready. Place caramel into a small piping bag. Make ganache. Pipe caramel about it fills the tart shells halfway. 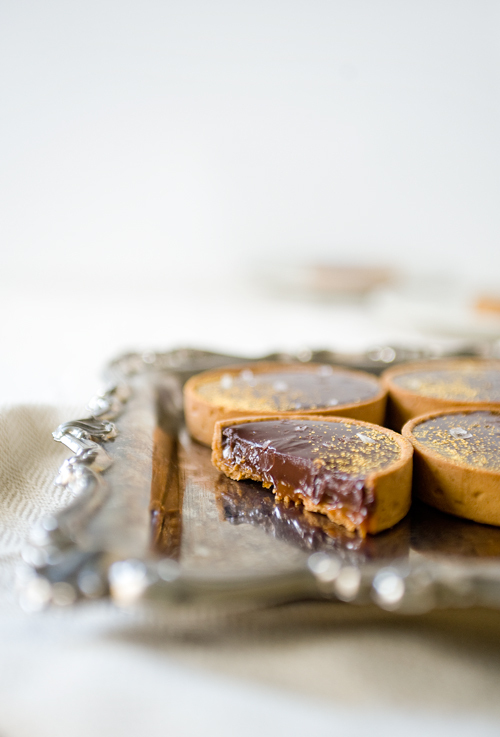 Filling tarts one by one, carefully spoon ganache onto the caramel, wiggle tarts gently to let the ganache level off. Finish the rest of the tarts. Let the ganache set a little, for about 10-15 minutes. Sprinkle tops with flaky sea salt, sift a little gold coloured powder on top to garnish. Tarts taste best the day they are made, but will keep in the fridge stored in a container for about 1-2 days. *Tip: cook your caramel to a dark amber colour to give it the most flavour, but be sure to keep an eye on it as it can burn in a matter of seconds. There's a thin line between dark and burnt, I like to cook it just before it becomes bitter and unpalatable. Silky caramel, luscious dark chocolate ganache in a thin, rich pastry shell with a touch of salt for balance. I fell in love with this dessert, yet again. I can’t believe I have been blogging for four years and am still going at it! This blog has a special place in my heart because it has brought me from a home baker, to a blogger, and now a professional pastry cook. What keeps me going is my passion and readers’ support. My blog doesn’t have a great deal of traffic, but seeing my recipes featured in various websites makes me so proud. Reading some of my first posts brings back so many memories and a realization – Yummy Workshop has came a long way to where it is now. I am very happy to share this recipe that I’ve never shared but is one of my absolute favourites – I hope you enjoy it as much as do! Thank you for being an awesome fan, Lokness! Thank you for your comment. I forgot to include the yield and sizes! This recipe makes 6 tarts of 7.5cm in diameter, 1.5cm high tarts. You can also try making a big version of up to a 20cm diameter round tart. Hope that helps! This looks amazing – I am totally loving the chocolate ganache topping.